Simply Recycled Aran is a beautifully simple yarn and is made using recycled cotton fabric from t-shirt production blended with acrylic to make a new soft yarn that's wonderfully easy to use, and easy to care for too. It comes in 8 fashionable, high summer colours including sun-baked terracotta, tan, cyprus green, citrus yellow, stylish grey and natural stone shades. Simply Recycled Aran is just so versatile - it's a great yarn to use for hand knits and crochet designs for woman, men and girls. For this bok, we've designed beautiful fan and feather sweaters and gorgeously textured cardies with stylish deep vee necks for women. There are trandy cable-edged hoodies and pretty lace-sleeved boleros for girls, and we've included easy textured sweaters for men. 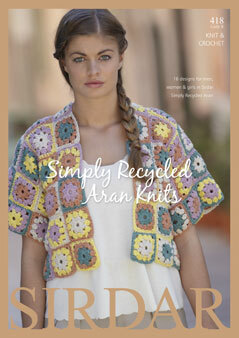 Simply Recycled Aran is perfect for crochet projects too and we've created stylish, kimono-shaped jackets in the most fabulous summer colours. 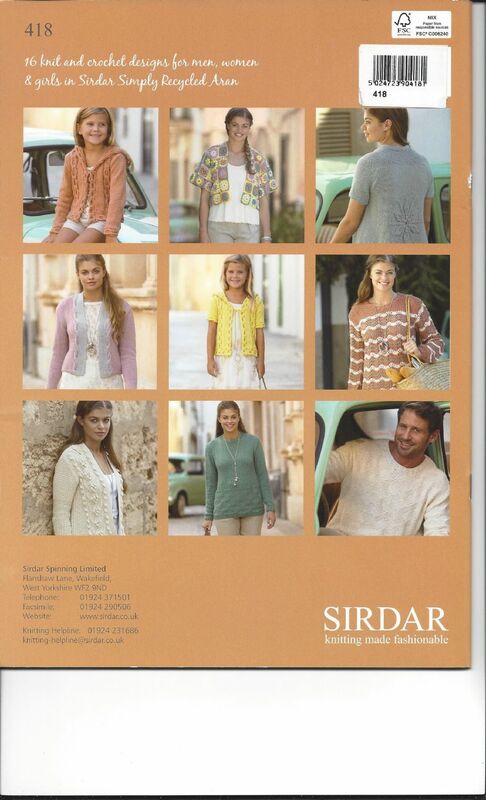 Simply Recycled Aran - stunning summer aran designs for all the family.